Most of us would love to have a bigger garage, but our property simply has no room to expand the garage footprint. This means that even when we have the opportunity to build a new garage, we still have to use our space as efficiently as we can. However, few of us are trained garage designers. Once we get our cars parked, we often struggle to find enough remaining space to store our collection of tools, sports gear, and household overflow. With the risk of theft, most people who live in the city or suburbs want to keep large items like ladders, bicycles, and kayaks safely locked in the garage. One solution is to look up; you probably have several feet of open space in the rafters. Here are three easy ways to make better use of that space. To shop online for these items, just use the bold-faced titles below as your Google or Amazon search terms. If you use a lot of power tools in your garage, out on the driveway, or in the yard, you may find yourself tangled in extension cords. Mounting a heavy-duty extension cord reel on your ceiling can be a great solution. If you have ever enjoyed the convenience of a self-serve car wash with the hose mounted on the ceiling, you can easily see the beauty of a ceiling-mounted extension cord. For example, think how much easier it will be to vacuum out your car with a ceiling-mounted power cord. Many garages barely have enough light for you to walk safely from the car to the door. Improving the lighting in your garage can make it much more enjoyable to work on projects out there. 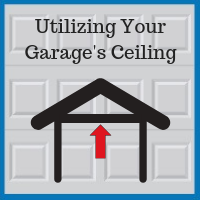 There are many ceiling-hung fixtures designed for the tough environment of an unheated Chicago area garage. While you are thinking about lighting, consider updating your garage windows, overhead garage doors, and garage entry doors to provide more natural light. Sturdy overhead racks allow you to safely stash plastic storage bins loaded with anything from out-of-season tools to holiday decorations. Even better are cable-lifted racks that you can raise and lower for easy access to those storage bins, eliminating the need to get up on a ladder. You can also opt for a pulley-driven hoist or lift designed to hold a specific item. You can find hoists with racks and straps customized to hold ladders, bikes, kayaks, paddleboards, and canoes. Ready to Create Your Dream Garage? 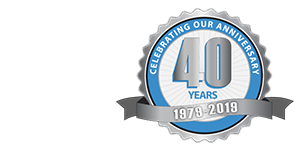 If you want to renovate your current garage or build a brand-new one, call the experienced Chicago custom garage designers at Blue Sky Builders. Contact us at 630-852-8485. What Are the Latest and Best Garage Door Opener Features in 2019? What Roofing Terms Do I Need to Know When Replacing My Garage Roof? Should My Garage Have One Double or Two Single Garage Doors? Can I Save Money By Installing Solar Panels on My Garage Roof? © 2018 Blue Sky Builders. All rights reserved.